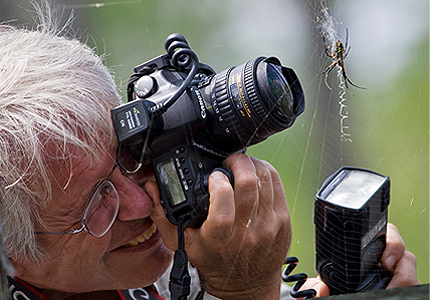 Critical Linkages Photographer David Moynahan uses his experience with capturing images of marine specimens, to photograph this spider. A sculptor, a painter, a marine biologist, a doctor, a father, a son, a husband, a hospice volunteer, and an organic gardener; these are just some of the many lives lived by Critical Linkages Photographer David Moynahan. In this post, we will walk with David down a couple of these paths and learn how, with a life so full of different people and career paths, his passion for photography persisted and changed from a hobby into a career. Growing up around an artistic father, David was raised with a creative eye and soon grew to love the arts of sculpture, painting, and drawing. He treated most of these skills as a hobby until his adult life, when he spent six years as a part time student in the Florida State University sculpture department. As a doctor, David’s time outside his Family Practice in Tallahassee was limited, but he always made the time to express his creative side. He explains, “I always had my hand in one form of art or another.” One year he enrolled in architecture school, in order to learn architectural and perspective drawing. With assistance from Critical Linkages Photographer David Moynahan, this scrub pawpaw demonstrates the eye-catching glamour of nature’s abstracts. Photo taken along the Kissimmee-St. John’s River Connector. Unique to his photography, David focuses much of his work on abstracts in nature. “Maybe my focus on abstracts is just an inherent sense of artistic beauty, or maybe it was growing up with my Dad painting abstracts and pointing out those that struck him.” Those who know David’s work may notice a particular focus on stone. “Perhaps this has to do with my being a sculptor; rocks are nature’s sculptures. I can’t help but admire them when I see grace in their form.” While he still enjoys sculpting, and may one day return to painting, David feels that, “Photography is what is fulfilling my creative outlet at this time. David grew up in Miami, close to Biscayne Bay. Here, he spent a lot of time walking the sea walls, and as a young child started collecting tropical fish. “Studying sea creatures along the shore is what I loved to do; beach combing and exploring along the bay. As I grew up, I became a salt water aquarium enthusiast.” These fish would make their new homes in the aquariums David learned to build. Pretty soon David was discovering which fish to house with each other, and would spend hours snorkeling, collecting fish, and studying their movements. When he graduated high school, David headed to Harvard where he studied biology and marine biology. Along with his studies he took a job with a professor during which we was asked to draw maps and sea creatures, which morphed into photographing specimens, and eventually to photographing live animals. At this time he spent his summers in the Bahamas, and his photographic subjects ranged from those of a tropical climate to the creatures of New England. About ten years ago, David ended his family practice in Tallahassee to spend more time with his family. A friend introduced him to an open position for a photographer at the Florida Fish and Wildlife Conservation Commission, where he’s worked for the past seven years. This was the start to David’s still growing photography career. 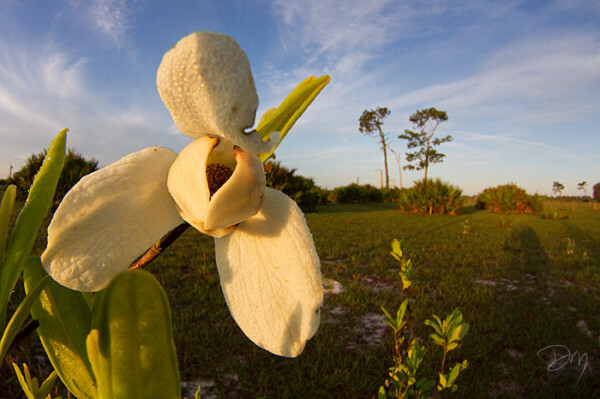 Since then, he’s worked as the photography editor for the Atlas of Florida’s Natural Heritage and as a contributor to LINC’s Florida Forever Calendars, among many other projects. 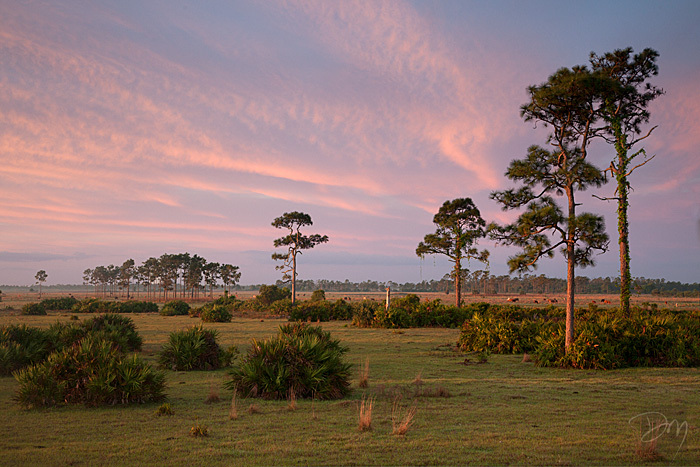 With cows in the distance, Critical Linkages Photographer David Moynahan captures the rosy glow of sunrise over the Kissimmee-St. John’s River Connector. United with surrounding conserved areas, this landscape provides habitat to much more than cows. In the Kissimmee-St. John’s River Connector, David spent days composing his shots, and uses them to explore the beauty of the place, with and without the cattle. Many of the shots he took from a ladder where he could gain larger perspective since he could not gain access onto many of the ranches. Surpassing the difficulties conservation photography often contains, David is content with this as the current path of his life. “The artist in me says, I’m doing what I’m doing because I love it, that’s number one. Then secondarily, I want people to see it so that they’re inspired.” A photographer and an artist at heart, this characteristic pervades his busy life and drives many of his choices. To learn more about David and his work, explore his website and his blog.